Bamboo clothing, bedding and bath goods retailer, Cariloha, this week launched its fall graphic tee collection for men and women. Each design is printed on Cariloha’s eco-friendly bamboo-blended fabrics and designed and inspired by Cariloha’s Art and Illustration team. Available exclusively at Cariloha stores, and online next month, the fall collection features six new women’s bamboo shirt designs and six new men’s all offered on 20+ different color combinations. Cariloha’s Bamboo shirts, featuring new graphic prints, are made from Cariloha’s proprietary viscose-from-bamboo blends, which consist of 70% viscose from bamboo (in most shirts) and 30% organic cotton for additional structure and ideal drape. Shirt styles include V-necks, hoodies, crew neck, scoops, racer tanks, Dolmans, and pocket crews. Retail price is $34. 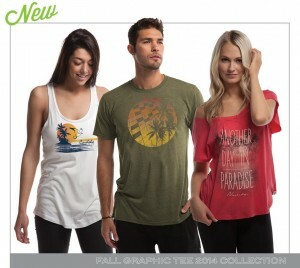 See the entire Cariloha Bamboo Fall 2014 Graphic Tee Collection here.